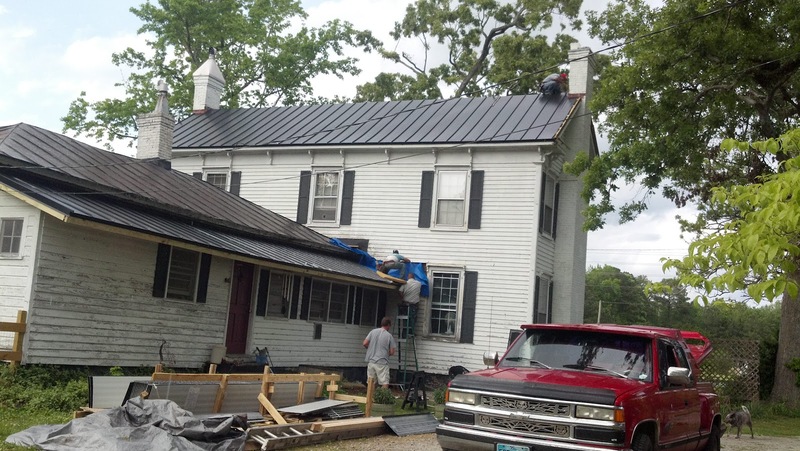 Three weeks ago the roofers took off our old metal roof and the underlying original cedar shake roof in preparation of the new metal that was set to arrive a few days later. Metal arrived on a big transfer truck on schedule, but it was the wrong metal and it had to be sent back. Our roof, which at that point consisted of only new plywood and a layer of tar paper, sat for almost two weeks before the correct metal arrived. By that point the tar paper had to be removed and replaced. The metal is now going up piece by piece. As of today the back of the house is covered in new metal and the crew will start on the front tomorrow (Monday) morning. I have to admit watching the guys on that second story steep roof makes me nervous but they seem not to mind being up there.